After Hurricane Katrina, almost all New Orleans public schools were taken over by the state and eventually turned into autonomous charter schools. All educators were fired, and the union contract was allowed to expire. Almost all attendance zones were eliminated so that families, in principle, could choose any publicly funded school in the city. While consistent with the school reform approaches in other cities, no city has gone as far as New Orleans. The mission of ERA-New Orleans is to understand these reforms. This page offers an integrated live summary of all our findings to date. Having released 26 policy briefs and 29 technical reports, we believe it is important to communicate how our findings fit together and what larger lessons they might imply for policymakers and practitioners. As with our policy briefs, these key conclusions below are based not only on our individual findings, but also patterns across our studies and analyses by other researchers. Conclusion #1: The New Orleans reforms have caused large gains in student achievement of 8-15 percentiles. Put differently, New Orleans’ performance ranking relative to other statewide districts increased from 67th of 68 districts before the reforms to 42nd afterwards. Conclusion #2: Academic results have emerged through gradual improvement over time, due in part to the process of school closure and takeover. Conclusion #3: The reforms had some unintended consequences—for equity, discipline, and income-based segregation—but other potential consequences did not occur. For example, student mobility declined, and there were no consistent trends in racial segregation. Conclusion #4: The city’s reforms significantly changed the teacher workforce and the way teachers viewed their work. Whether these changes were helpful is a significant point of contention. Conclusion #5: School spending increased by 13% with the reforms, which may partially explain the overall improvement in outcomes. However, these funds were used mainly to increase administrative spending, and instructional spending declined. Conclusion #6: The state’s school voucher program, the Louisiana Scholarship Program (LSP), a related type of school reform, initially had negative effects and now seems to show no effect on student outcomes. However, it is still too early to assess the policy because the results are changing from year to year. Conclusion #7: The above conclusions call into question some basic assumptions about the hallmarks of quality teachers and appropriate use of school spending, as well as the advantages and disadvantages of market-based school reform. School autonomy, choice, and competition also come with a loss of economies of scale, increased transportation costs, and difficulty in addressing system-wide challenges. Conclusion #8: Whether other cities can expect similar academic benefits from New Orleans-style reforms remains uncertain. These reforms are most likely to work in urban districts that are attractive to young educators and where school districts are very low performing. New Orleans is an extreme case on all of these dimensions. Conclusion #1:The New Orleans reforms have caused large gains in student achievement of 8-15 percentiles. Put differently, New Orleans’ performance ranking relative to other statewide districts increased from 67th of 68 districts before the reforms to 42nd afterwards. Early on, critics worried about several other potential explanations for these gains (such as the changing population in the city), but we have tested these alternative explanations and find that the reforms caused the vast majority of the improved measurable outcomes. 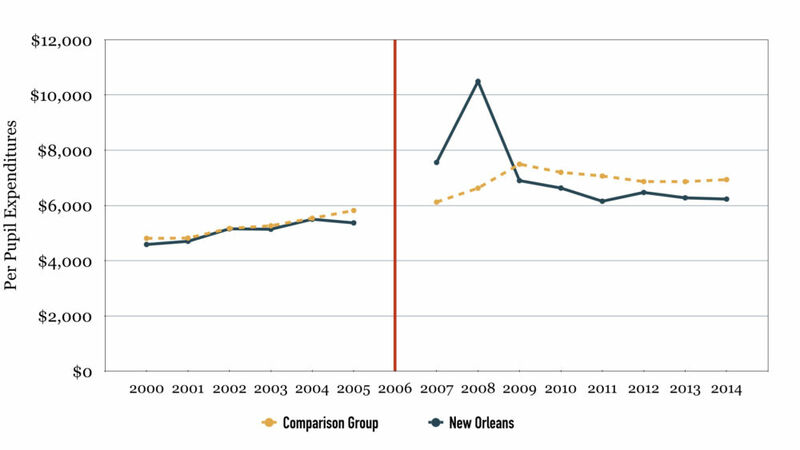 Figure 1: Student achievement increased in New Orleans relative to similar school districts. Notes: Figure 1 shows that, prior to the reforms, New Orleans and the matched comparison group were on similar trajectories. After the reforms, the two lines quickly converged, suggesting a large positive effect of the reforms. The y-axis shows the effects in terms of standard deviations, and the 8-15 percentile points translate to 0.2-0.4 standard deviations. Source: ERA-New Orleans’ analysis of data from the Louisiana Department of Education. We see no evidence that the increase in achievement came at the expense of other outcomes. For example, higher test scores might arise if low-scoring students were more likely to drop out. We are in the process of a more direct and comprehensive examination of high school and graduation college outcomes. One key reason for the improvement shown in Figure 1 was that the state made decisions about school closures and takeovers on the basis of school performance. These decisions affected many of the schools the state had initially opened in the immediate post-reform period, and most students in closure/takeover schools then moved to higher-performing schools in the city. Roughly one-third of the reforms’ large positive effects on measured student achievement can be attributed to this process. Figure 2: Students in schools that were closed or taken over experienced significant improvements in student achievement. 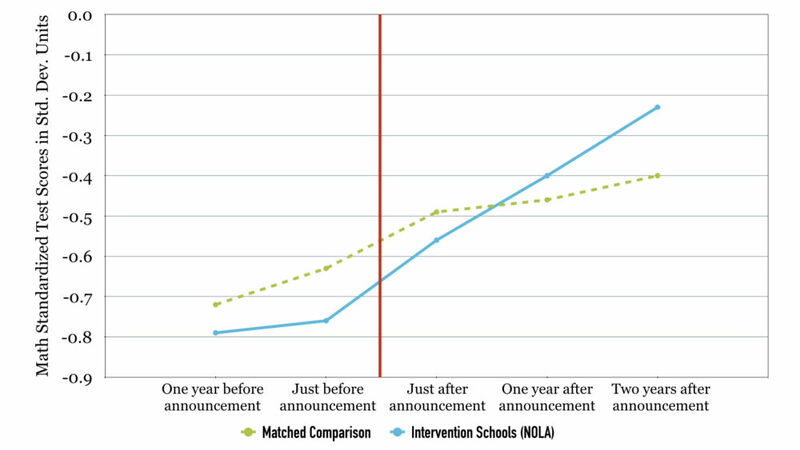 Notes: Figure 2 shows the math outcomes of individual students in closure/takeover schools before and after they experienced intervention, compared with a matched comparison group of students with similar low achievement. The scores, in both math and ELA, largely track one another beforehand. The fact that the results diverge afterwards indicates a significant effect of closing and taking over schools. Source: ERA-New Orleans’ analysis of data from the Louisiana Department of Education. Overall, the results have continued to improve even as the role of the state and school districts has increased in areas such as enrollment and expulsion. In ongoing studies, we are trying to understand to what extent this is a cause-and-effect relationship between these policies and student access to quality schools. Conclusion #3: The reforms had some unintended consequences—for equity, discipline, and income-based segregation—but other potential consequences did not occur. For example, student mobility declined, and there were no consistent trends in racial segregation. While all student subgroups demonstrated higher achievement gains after the reforms, white and middle class students benefited more than black and low-income students, increasing this form of inequity. This might be due in part to the fact that students became more segregated on the basis of income, and some schools apparently selected students (rather than students choosing schools) and suspended and expelled students at high rates in the early years. Other potential unintended consequences did not emerge. One concern has been that school choice would increase student mobility as families shopped around for the best schools, creating disruption for mobile students and for their classmates. However, student mobility dropped (Figure 3). Also, there were no consistent trends in racial segregation. Figure 3: The post-Katrina school reforms reduced student mobility. 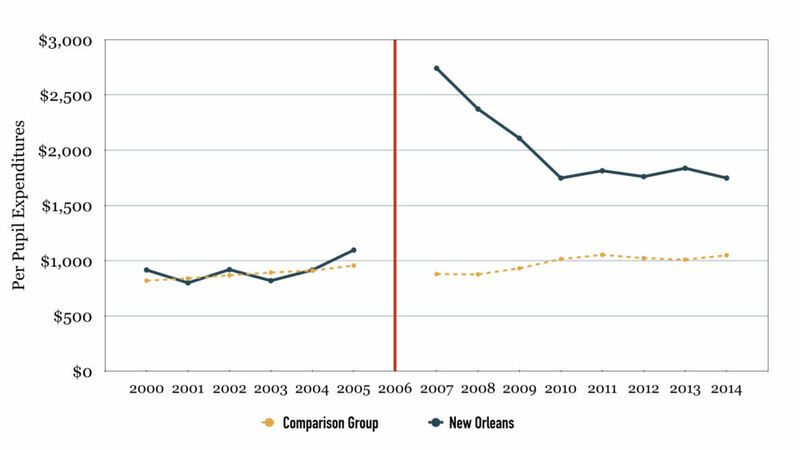 Notes: Figure 3 shows the annual rates of student mobility in New Orleans and a matched sample of school districts before and after the reforms. 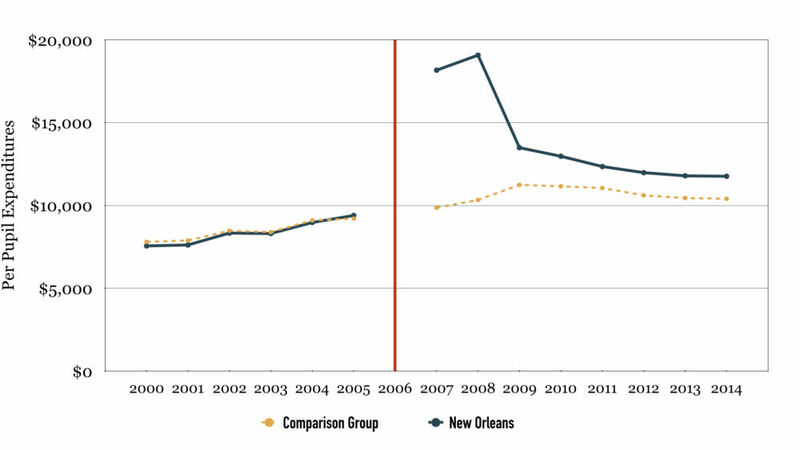 The figure shows that level of mobility and the gap with other districts both dropped in New Orleans after the reforms. We define mobility here to exclude “structural moves” where students reach the last grade and move on to middle or high schools. Source: ERA-New Orleans’ analysis of data from the Louisiana Department of Education. Another potential concern, especially with the aggressive closure and takeover of schools based almost entirely on raising student test scores is that schools might all look alike. However, New Orleans schools have maintained or increased diverse program offerings. This finding has been confirmed by a second study by another organization. It is important to emphasize, however, that there was some diversity in programming (for example, schools specializing in the arts) in New Orleans before the reforms, and that having both the school district and the state authorize schools helped to maintain the old forms of program diversity, while also creating new ones. Another general concern in school choice systems is that low-income families have less access to personal transportation, which may limit their choices. In addition to being focused on extracurricular activities and academic performance, we have found that practical realities such as distance to school and availability of after-school care are of particular concern to low-income families. The fact that the state required its charter schools to provide transportation may have reduced this problem. Given that all teachers were fired and that schools gained considerable control over personnel, it is no surprise to see changes among the city’s teachers. Many of the usual hallmarks of school quality—low teacher turnover, high levels of experience, and more advanced credentials—declined considerably (Figure 4). In addition, the new workforce has weaker local roots and ties to the community. Figure 4: Teacher experience and credentials declined after the reforms while teacher turnover increased. 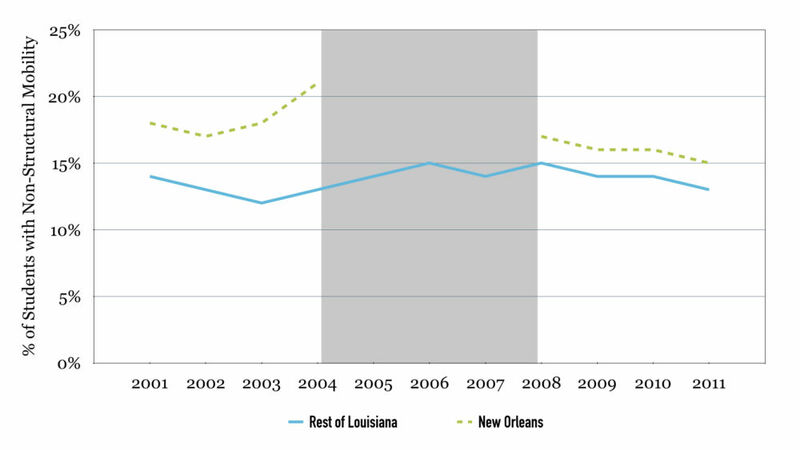 Notes: Unlike the earlier figures, Figure 4 simply displays trends within New Orleans without a comparison group. While not shown, there were minimal changes in teacher characteristics in our comparison groups after the reforms. “High level of certification” includes the top two certification levels in Louisiana. Source: ERA-New Orleans’ analysis of data from the Louisiana Department of Education. The increased turnover is partly driven by the fact that many newly hired teachers came from teacher preparation and placement programs whose completers are less likely to stay in the profession. Lower job security also likely increased turnover, both by making the jobs less attractive and increasing dismissals. Consistent with this theory, in statewide analysis, we found that reduced tenure led to increased teacher departures from public school teaching. There is also some evidence that the number of students graduating from local universities with teacher credentials has also declined sharply after the New Orleans reforms. These changes in personnel-related policies have also apparently shaped teachers’ views and perceptions about their work. Our survey of returning teachers (Figure 5) shows that, as intended, teachers believe low-performing teachers are much more likely to be dismissed under the reforms. This reduction in job security, along with decreased teacher autonomy and longer work hours, may partly explain another key finding—returning teachers were less satisfied with their jobs. Returning teachers also reported that schools are much more data-driven and goal-oriented, especially with respect to academic goals, and have stronger school cultures and support for teachers. Figure 5: A survey of returning teachers reflects their perceptions of the reforms. Notes: The responses in Figure 5 are based on a survey of 323 teachers who taught in New Orleans public schools before Katrina and returned to teach in the city’s publicly funded schools after the reforms. “More now” indicates that aspect of the given work environment (e.g., teacher autonomy) was more common after the reforms. Source: ERA-New Orleans survey data and analysis. The fact that schools have much more control over personnel under the reforms means that teacher evaluation is a potentially important determinant of continued employment, salaries, promotion and more. Based on interviews with school leaders and teachers, we found that some New Orleans schools responded to state-mandated teacher evaluation by being more reflective about their teaching, while others complied with state evaluation law or acted strategically and in ways unintended by policymakers. It is noteworthy that these changes in the teacher workforce and perceptions were accompanied by strong improvements in student outcomes (see Figure 1). This suggests that the usual hallmarks of school quality (experience, certification, and turnover) may not be as important as some have come to believe. Conclusion #5: School spending increased by 13% with the reforms, which may partially explain the overall improvement in outcomes. However, these funds were used mainly to increase administrative spending, and instructional spending declined. School spending increased relative to comparison districts because of changes in both government funding and increased philanthropic dollars (Figure 6). This remained true even after the initial spike, which was apparently due to the slow return of students combined with the start-up costs for the new system. While increased spending probably explains some portion of the reform effects, prior research suggests that the effects on achievement from this funding increase alone would generate much smaller effects than what we see in Figure 1. Therefore, it is highly unlikely that increased funding explains a substantial share of the achievement effects. Figure 6: The reforms increased operating spending. However, while New Orleans publicly funded schools spent more after the reforms overall, they spent less on instruction (Figure 7). The reduction in instructional spending was partly driven by reduced teacher experience (Figure 4), as well as the fact that charter schools are not required to participate in the state pension system. Figure 7: The reforms reduced instructional spending. Notes: Figure 7 shows instructional spending for New Orleans publicly funded schools and for a matched comparison group from other traditional school districts. Source: ERA-New Orleans’ analysis of publicly available school financial records. The reduction in instructional spending was also coupled with higher spending on administration (Figure 8). Schools hired more managers and paid them higher salaries. The increase in administrative spending suggests either that more administrative work is required at the school-level (i.e., loss of economies of scale) in this decentralized system or that the educational models of charter schools involve higher management costs and perhaps a more top-heavy approach. Figure 8: The reforms increased administrative spending. Notes: Figure 8 shows administrative spending for New Orleans publicly funded schools and for a matched comparison group from other traditional school districts. Source: ERA-New Orleans’ analysis of publicly available school financial records. Taken together, these results suggest that, at least in some cases, measureable school improvement is possible without increasing instructional spending or having a stable, experienced teacher workforce. It could be that the role of these factors depends on the context. The traditional hallmarks of school quality might be more important in traditional school districts that give teachers more autonomy and job security, for example, but not in charter schools that are more data-driven and generally prefer different modes of management. In other words, there might not be a single recipe for success, but rather many schooling models that can work well when implemented well and aligned with the policy environment. Conclusion #6: The state’s school voucher program, the Louisiana Scholarship Program (LSP), a related type of school reform, initially had negative effects and now seems to show no effect on student outcomes. The LSP has shown no effects on student outcomes after three years. As shown in Figure 9, the program seemed to get off to a very rough start with very large negative effects, before rebounding somewhat. The reasons for the initial “dip and return,” and the absence of positive effects three years later, have been a subject of active debate. Many of the possible reasons are discussed at the end of our recent policy brief on the topic. 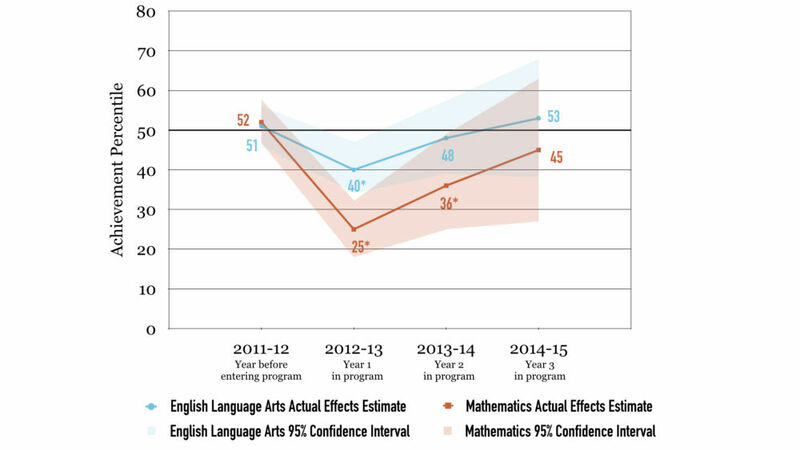 Figure 9: The LSP had no effect on student achievement after three years. Notes: Figure 9 shows the effects of using vouchers. Unlike the other figures, the achievement effects estimated here are the result of random voucher assignment, not the method we used above to identify effects of other aspects of the New Orleans school reforms. Source: ERA-New Orleans’ and University of Arkansas’ analysis of data from the Louisiana Department of Education. Our voucher research also suggests that many private schools in Louisiana did not participate in the program because they did not want to accept current or future burdensome regulation. This would be a problem especially if the rules keep out high-quality private schools. While participating voucher schools did not apparently differ on the main direct measure of quality, participating schools did tend to have lower-than-average tuition and enrollment levels. If quality had been lower, this would be a potential reason the voucher program had no effect. The larger issue is about which rules generally reduce the supply of high-quality schools and whether these costs outweigh the benefits of improved market functioning. Our studies of charter schools suggest that some regulation can improve market outcomes, but more research is necessary to understand whether, and under what circumstances, this conclusion holds. Our other voucher studies suggest that vouchers had no effect on racial segregation and decreased the percentage of students who were identified for special education. Conclusion #7: The above conclusions call into question some basic assumptions about the hallmarks of quality teachers and appropriate use of school spending, as well as the advantages and disadvantages of market-based school reform. School autonomy, choice, and competition also come with a loss of economies of scale, increased transportation costs, and difficulty in addressing system-wide challenges. Our research suggests that substantial improvement in student outcomes is possible without either of the two strategies that have dominated the education debate for many decades. Student achievement increased (Conclusion #1) even while teacher credentials and instructional spending (see Conclusions #4 and #5) declined. Also, in contrast to other cities where closure and takeover have not helped or even harmed achievement, New Orleans schools were closed and taken over on the basis of performance so that this strategy played a more productive role (Conclusion #2). However, our findings also suggest some disadvantages of market-based school reform. One potential interpretation of the increase in administrative costs is that decentralized, choice-based systems are inherently more costly to administer because of a loss of economies of scale. Each school had to re-create the services that school districts would normally provide to all schools. Also, school choice greatly increased the distances that students travelled and, therefore, nearly doubled transportation costs to upwards of $750 per student per year (transportation costs are excluded from the above figures). Decentralized systems are also generally at a disadvantage when it comes to addressing system-wide problems such as the supply of teachers. Conclusion #8: Whether other cities can expect similar academic benefits from New Orleans-style reforms remains uncertain. More Money. It is not only that the schools experienced “reform,” but also that they spent a great deal more money relative to the comparison districts. States and cities seeking to save money or increase student achievement without additional resources may be disappointed. An Ample Educator Workforce. There is wide agreement on the importance of educators in creating quality schools. For New Orleans, the supply of educators expanded in ways that other cities will generally not be able to replicate. It was an attractive city for young people even before the reforms. Many apparently also wanted to come to New Orleans to help rebuild the city, while others, especially school leaders, may have come because the city became a national hub of school reform. Low Starting Point. 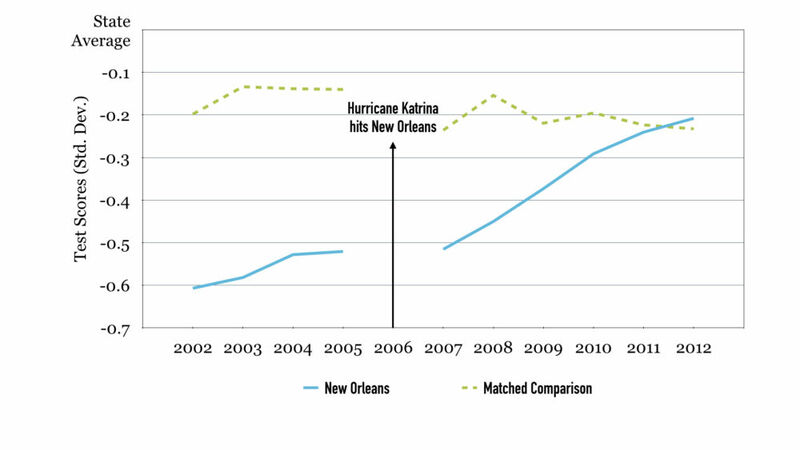 New Orleans was a very low-performing district in the pre-Katrina period. Theory and prior research both suggest that the reforms should work best in low-performing, urban school districts. High School Graduation and College Entry. We are examining student-level data to estimate the effects of the reforms on high school graduation and college entry. Discipline and Crime. We are studying the effects of the reforms on suspensions and expulsion rates, as well as students’ involvement with crime. Student Perceptions. Research shows that students are fairly good judges of school quality, but it is normally difficult to collect data on students’ views and perceptions. We are developing a Citywide Youth Survey to gather data on student perceptions. The data will be used to provide public reports on how children view their schools and communities. Early Childhood Education. While the New Orleans reforms, and our analyses to date, have focused on K-12 education, there is broad agreement that early childhood education is important for improving long-term life outcomes, especially among disadvantaged children. We are examining how parents choose early education programs, as well as the effect of schools’ public quality ratings on parents’ choices. We are also partnering with OPSB and RSD to explore ways to improve parents’ experiences in the early childhood application process. More on Teachers and Administrators. In addition to the four studies we have already completed on teachers, we are studying how they are paid, how they are promoted to administrative positions, and how well schools are able to retain their highest-performers. We cannot measure everything—and not all decisions about education and school reform can be answered with data. But with this research, we can answer some of the important questions on the minds of community members in New Orleans and across the country who are seeking to provide high-quality education to all the nation’s children.